← Whose Journey Would You Take? TripAdvisor recently published a list of travel tips which I am borrowing from freely below. (They have my permission to quote me whenever they want!) You have probably used or heard about some of these before, but there might be something here for even the most seasoned traveler. 1. Check in online 24 hours ahead. You can bypass lines at check-in, possibly get a better seat, and pay a lower fee for each checked bag depending on the airline. Once past TSA refill your own bottle of water. 2. Carry an empty water bottle. Fill it at a fountain after you go through security. Collapsible bottles are available online or in sports stores. Note, this won’t save you money if you are the sort of person who will lose the special bottle easily. 3. Use cable ties (zip ties) to fasten zipper pulls on luggage you check. TSA approved locks are excellent for flights in the US as domestic baggage inspectors can unlock them. But international inspectors will cut off your TSA padlocks, possibly damaging the zipper pull. (Ask me how I know.) Zip ties are enough to foil intrusive non-inspectors but lightweight enough to be easy for inspectors to remove. You should plan ahead so that you can cut them off at your destination. Heavy duty nail clippers work well. 5. Grab a luggage cart for free by cruising the transportation pick-up area, usually just outside the luggage claim area. 6. Carry an outlet adapter for multiple charges. If you are always finding your electronics nearly out of juice an outlet adapter will let you charge more than one device at a time. You can offer the additional outlets to other grateful travelers. People watching at the airport can be a bright spot in your travel day. 7. For free Wi-Fi sit right outside an airline club lounge. The club’s signal will probably be strong enough to provide good reception throughout the area. If you have a long connection or delay you might want to purchase a day pass ($25-$50) to a club lounge for the snacks, drinks, comfy chairs and VIP treatment. 8. Another option in case of delay is to use the GateGuru app to see what restaurants and activities are available in other parts of the airport. Many airports pride themselves on being destinations as well as transportation hubs. 9. Wear out the kids before getting on the plane. If there is not a convenient play area to expend excess energy, take out the inflatable ball you have brought along and toss it around in an empty boarding area. 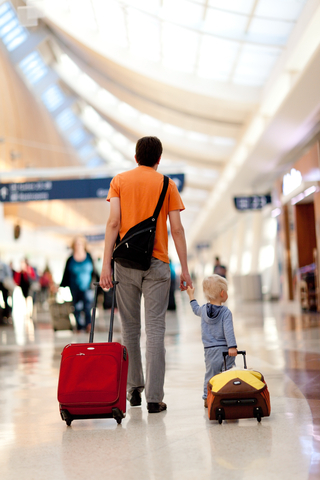 What are your favorite tricks for traveling trouble-free? Please share so we can all benefit! This entry was posted in Travel, Uncategorized and tagged airline lounge, airport, luggage, travel, TSA, water bottle. Bookmark the permalink.